I’m purchasing an Xbox Live Indie Game every day, seeking out the quality titles that got lost in the shuffle and no longer appear in the top 50 downloads. Today is day #79, and today’s game is “Dock’em”. What I love about games like this is that they’re great for short pick-up-and-play gaming sessions. A quick game before bed, or between tasks, for example. This is one of those deceptively simple games that gets harder than you expect over time. You guide three types of boats to their respective docks, but each type of boat has a different destination in mind and travels at a different speed. 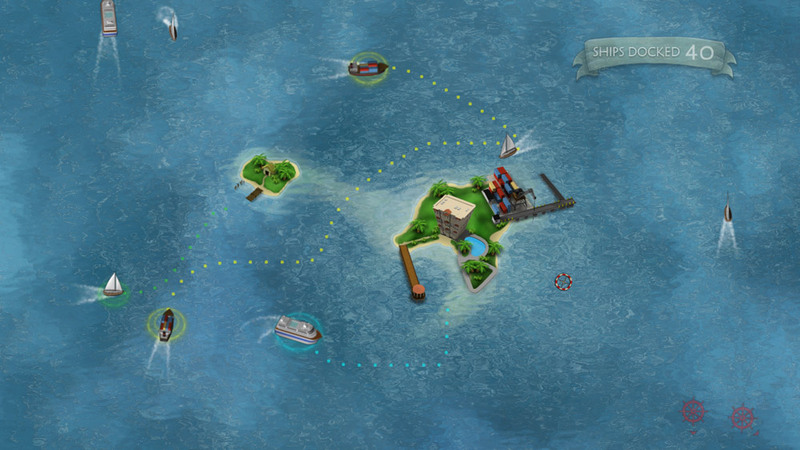 As the game progresses, it gets more and more challenging to choose a route that lets each of the growing number of ships make it to their docks without touching each other or land. In the higher levels you’ll likely find yourself sending some boats on the scenic route, just to buy yourself more time as you sort out the routes (though the sooner you get them in to dock, the higher your score so you won’t want to do that when you don’t have to). Beautifully done graphics paired with simple and effective controls make this a unique 80 Microsoft Point game that’s easy to recommend. There’s sadly no multiplayer, nor even local scoreboards, but that wasn’t a big deal for me as all I wanted out of it was something unique for short play periods, and I got it. For a second opinion, check out Kobun’s review of Dock’em. It’s disappointing that a game like Flight Control can sell so much while an excellent, similar, and visually superior title such as Dock’em gets ignored. Nothing against Flight Control, but I find Dock’em superior in every manner. Too bad the graphics and detail would be lost on an iOS port.